The sixth series of banknotes introduced by Bangladesh was an issue which lasted for many years, unlike the first five series of banknotes which were used for short periods (see IBNS Journal Volume 51 Numbers 1 and 2). During the long period of the Sixth Issue, a great number of variations were introduced into this series, making it one of the most intriguing series of banknotes for the collector to complete. While the sixth issue was still circulating, the seventh issue was introduced – a series consisting of only three notes – and this series circulated along side notes of the sixth issue. The first five series of notes issued by Bangladesh were characterized by a degree of confusion in their introduction and the sixth series, while commencing in an orderly fashion, became similarly confused in its later issues. While the Seventh Issue (described in this article) saw new notes issued, some of the designs of the notes in the Sixth Issue continued to be issued well into Eighth, Ninth and Tenth Issues (not described in this article); i.e. the 2-, 5- and 20 taka notes. 2-taka notes – these continued to be issued with dates, commencing in 2002 and ending in 2010. Apart from changes in signatures and security threads, they belong to the same type as the notes originally issued in the Sixth Issue. 5-taka notes – after ceasing to be issued about 2000-2002, a reduced size 5-taka note dated 2006 was issued several years later. In 2007 the note was again issued, but this time in the larger size originally used in the Sixth Issue. A variety similar to the 2007 issue was again released dated 2010. These later notes are included in this study, although the smaller size, 2006-dated note should be considered a separate type. 20-taka notes – these notes were reduced in size, dated and released from 2002. The reduced size notes are not covered in this study, as they are regarded as a different type and part of a later issue of notes. Within this article, printers have not been identified for the various note types and varieties. While a number of the earlier banknotes in the Sixth Issue are believed to have been printed by some of the international security printing companies, there is a paucity of evidence to be certain of the printer. By the end of the Sixth Issue it is understood most, if not all, issues were being printed by Security Printing Corporation of Bangladesh Limited. As for all preceding banknotes issued in Bangladesh, the 1- and 2-taka notes are issued by the Government of Bangladesh and all other denominations are issued by the Bank of Bangladesh. Notes issued by the Government carry the signatures of the Secretary of Finance and the notes issued by the Bank carry the signature of the Governor of the Bank of Bangladesh. The chart of signatories for the Finance Secretaries (see Chart 1) excludes the first four Finance Secretaries who signed only notes of the first five issues, and starts with Ghulam Kibria, the fifth signatory. The chart of signatories for the Governor of the State Bank (see Chart 2) excludes the first two signatories who signed the notes of the earlier issues and commences with M. Nurul Islam. The chart then shows the next four signatories but omits Dr Fakhruddin Ahmed, the eighth governor to sign notes (as he did not sign any notes in the Sixth and Seventh Issues), before listing Salehuddin Ahmed and Atiur Rahman who signed later dates. For the earlier Types of promissory clause, see IBNS Journal Volume 51 Number 1, page 26. First issued 1 March, 1982. Front The State Emblem of Bangladesh (see Figure 2). Size 100 x 60 mm. Watermark Attentive tiger (Type 4). Serial number All varieties have seven numerals, but the number of letters in the prefix varies. Colours Front – Orange, light brown and purple, with brown text. Back – Orange, light brown and purple. The 1-taka note (see Figure 1) of this series was first released on 1 March 1982 and is very similar to the 1-taka note of the fifth series. There are only three differences between the first variety of this note and its predecessor. The most noticeable difference between the two notes is the use of a white area over the watermark on the front and back of the newer note, replacing the pale colour used on the previous issue. The second change is the watermark, where the upright head of an attentive Bengal tiger (see Figure 29) is used in place of the previous depiction of the resting tiger. The third change is the signatory, and in this feature there are many variations. Signatory is designated অর্থসচিব (Finance Secretary) and the note has a solid security thread. Ghulam Kibria held the post of Finance Secretary twice. Having been removed from the position following the coup d’état by Lieutenant-General Ershad in 1982, he was reappointed to the position some five years later. Thus there are two issues with his signature and they are treated as two varieties simply because the font used for the serial numbers and the prefixes has become slightly bolder (see Figure 3). This is perhaps a long bow to draw in declaring a separate variety and it will be up to collectors to decide if they consider this slight variation a valid variety. Korshed Alam first signed the 1-taka notes as অর্থসচিব (Finance Secretary), then as মুখ্য অর্থসচিব (Principal Finance Secretary, see Figure 4) – the only person to sign with this designation. When Nasimuddin Ahmed began signing the notes he used the shorter title, making the first notes signed by him the same variety as the earlier issues. However, with the introduction of the micro-printed security thread, he also signed the notes of the ‘c’ variety. The use of the micro-printed thread for the 1-taka note is an interesting development, but its use is made a little more intriguing by the text found on the thread. The text is Bengali and reads বাংলাদেশ ব্যাংক (Bangladesh Bank). It is supposed the use of the same micro-printed thread as that used on the higher denomination notes is one of economy, in having all notes carrying the same security thread. However, since the responsibility for the issue of the 1-taka notes lies with the Bangladesh Government and not the Bangladesh Bank, it is strange to find the name of the Bank appearing on the security thread when it appears nowhere else on the note. During the issue of this series of bank notes, the 1-taka coin was introduced. While the coins and bank notes continue to circulate concurrently during the period of this issue, the 1-taka note ceased to be produced and the number of 1-taka notes in circulation steadily declined. First issued 29 December 1988. Back A Magpie Robin, or ‘Doyal’. Colours Front and back – Orange, light green and olive green. The 2-taka note (see Figure 5) was introduced on 29 December 1988. The front of this new denomination note is dominated on the right by a picture of the ‘Shaheed Minar’ (see Figure 6) and on the left by a white area reserved for viewing the watermark. As the responsibility for the issue of the 2-taka note lies with the Bangladesh Government, the Bengali text across the top of the note reads গণপ্রজাতন্ত্রী বাংলাদেশ সরকার (People’s Republic of Bangladesh), below which is written দুই টাকা (Two Taka). The signature is of the ‘Finance Secretary’. The Bengali text below the Shaheed Minar reads ভাষা আন্দোলনের শহৗদ মিনার (Monument for the Martyrs of the Language Movement). The back of the note has a ‘Doyal’ (or Magpie Robin) on a branch to the left, a white area for the watermark to the right, and a reduced depiction of the State Emblem of Bangladesh (see Figure 2) in the bottom left. The text on the back of the notes is all in Bengali, as it is on the 1-taka notes. The name of the country and the value of the note are given prominence, while below the Doyal is written জাতৗয় পাখৗ দোয়েল (National Bird Doyal). Appearing at the top left of the white circle holding the watermark on the front of the note, and to the top right of the similar circle on the back of the note, is a perfect registration device. The pattern of the device consists of three leaf-like shapes in a white triangle. The three leaf shapes are representative of the three jute leaves appearing atop the State Emblem of Bangladesh. With the Type A micro-printed security thread reading বাংলাদেশ ব্যাংক (Bangladesh Bank). With the Type F micro-printed security thread reading বাংলাদেশ সরকার (Government of Bangladesh). Dated 2002; Type F micro-printed security thread reading বাংলাদেশ সরকার (Government of Bangladesh). Dated 2002; Type A security thread reads বাংলাদেশ ব্যাংক (Bangladesh Bank). The first micro-printed security thread used on the 2-taka notes carried the name of the Bangladesh Bank in Bengali (বাংলাদেশ ব্যাংক), as it does for the 1-taka note. However, the anomaly of having the name of the Bank on a note that was the responsibility of the Government was recognized, and the adjustment appears with the introduction of the Type F thread, which reads বাংলাদেশ সরকার (Government of Bangladesh; see the section on ‘Security Threads’ at the end of this article). Following the introduction of the security thread reading ‘Government of Bangladesh’ (in variety ‘c’), the old security thread, with ‘Bangladesh Bank’ appeared in variety ‘f’. It is thought this occurred because old stocks of paper, with the earlier type of thread, were used for the notes signed by Zakir Ali Khan. The smaller watermark used in the ‘d’ variety is the only known use of this variety of watermark. The notes printed by the Security Printing Corporation of Bangladesh Limited have, at times, been subject to quality control issues. One of the areas where poor colour control can be seen is in the signatures of the notes. The ‘g’ and ‘h’ varieties listed for the two-taka note, with black and brown signatures an example of quality control issues. Advanced collectors might search for variations in colours amongst notes of the Sixth Issue. Given they are the result of quality control issues, the ‘g’ and ‘h’ varieties might not be considered true varieties, simply the one variety with one note having quality control issues. The notes dated from 2002 to 2009 were released during the period the Eighth, Ninth and Tenth Issues were circulating. N.B. Dr Fakhruddin Ahmed served as Governor after Mohammad Farashuddin, but he did not sign notes discussed in this article and so his signature is absent from the chart. He did sign notes in later series. First issued 24 October, 1981. Front Mihrab of the Kusumba Mosque. Size 120 x 65 mm. Colours Front – Predominantly brown, with an under-print of orange, purple, green and pink. Back – Brown with a green under-print and green highlights to the left. The 5-taka note of this series (see Figure 7) was first released on 24 October 1981. It is very similar to the note it replaced in the fifth series – maintaining the mihrab of the Kusumba Mosuqe on the front and the factory and river scene on the back – with only two changes apparent in the initial variety of the new series. The changes are the introduction of the new watermark (Type 4) and the introduction of a white disc on the front of the note over the watermark. However, in subsequent releases there were subtle changes to this note including the style of serial numbers, the security thread, and in the drawing of the illustration on the back of the notes – all contributing to create several varieties. There are several intriguing factors used to define the varieties listed above: the text on the micro-printed thread, the size of the font used for the serial numbers and the illustration on the back of the notes. The differences in the micro-printed Type A and C threads concern the size and shape of the letters used to write ‘Bangladesh Bank’. The variation in the threads is explained at the end of this article under the heading ‘Security Threads’. The difference in the fonts for serial numbers can be seen at Figure 28. The change in the illustration on the back of the notes, which differentiates varieties, is very subtle but distinct, as it is easy to tell the differences when observing two notes together (Figure 8). The simplest distinguishing feature is the boat in the left foreground, where the shaded area on the bales is dark on the original illustration and pale on the second variety. Another area to observe is the bank of the river just above the sail of the second boat. On the first illustration, there are four lines, with the top three being solid and the bottom one dotted, whereas on the second depiction the top is dotted, while the lower three are solid. A third point which differentiates the illustrations is the shading on the roof of the shed by the shore of the river, where distinct differences can be seen. There are numerous other small changes, most of which have to be viewed by a magnifying glass, but the most simple example to observe with the naked eye is the shading on the bales on the boat to the left. First issued 3 September, 1982. Back Spillway of the Kaptai Dam. Size 140 x 70 mm. Colours Purple intaglio printing with an under-print of green, khaki, pink and orange. Back – Purple and green, with an under-print of orange and blue. The 10-taka note of the sixth series (see Figure 9) made its appearance on 3 September 1982 and is a completely new design. The dominant colour of this note is burgundy, set against a background of pale green, orange and red. At the right-hand side, on the front of the note, is a large vignette of the Atiya Jami Mosque at Tangail, below which is written আতিয়া জামে মসজিদ, টাঙ্গাইল (Atiya Jami Mosque, Tangail). To the left is a white square holding the watermark, and between the mosque and the watermark is the promissory clause lying over a green and pink pattern. The back of the note carries an illustration of the spillway of the Kaptai Dam, and written below the illustration is কাপ্তাই বাঁধের স্পিলওয়ে (Kaptai Dam Spillway). To the right of the illustration is a white disc holding the watermark, with a section of a pylon used to carry electricity wires overlaying part of the white area; the illustration signifying the delivery of electricity generated from the dam. To the right of the white disc, in the area shaded green, are two small white shapes that register perfectly with similar patterns on the front of the notes. Solid security thread; 3.0 mm serial numbers; text reading ‘Allahu Akbar’ (God is great) in Bengali (আল্লাহু আকবর) and Arabic (ﷲ أكبر) above the mosque. The differences in the serial numbers between the ‘a’ variety and the other varieties are not easy to distinguish, unless two notes are observed together. However, once placed together the difference in fineness of the characters is obvious (see Figure 10). That the different fonts are the result of different printers is almost certain, as the ‘b’ variety starts a new sequence of the serial number, commencing with a single letter prefix after the ‘a’ variety had progressed well into a sequence of double letters in the prefix. Most varieties of notes in the sixth issue are determined by changes in the size of the serial numbers, changes to the security thread and the use of different signatures; but for the 10-taka note there are two varieties determined by the addition of text on the front of the notes. The first variety is where an inscription appears across the top of the Atiya Jami Mosque (see Figure 11). This text reads আল্লাহু আকবর and is the Bengali and Arabic rendition of ‘Allahu Akbar’, which means ‘God is great’. It is not known why this inscription was added for one variety and then removed for subsequent varieties. The second variety to include additional text is the last variety, which carries an inscription overprinted on the area holding the watermark. The inscription reads বিজয় দিবস রজত জয়ম্তী '৯৬ (Victory Day Silver Jubilee ‘96; see Figure 12). This overprint celebrates the twenty-fifth anniversary of victory over West Pakistan, in the War of Liberation, on 16 December 1971. The decision to issue an overprinted note to celebrate the Silver Jubilee of the Liberation of Bangladesh appears to have been delayed, with news of the intention to make this issue being made as late as 3 December 1996. In the first two weeks of December 1996, leading up to the Silver Jubilee, there were many activities planned to celebrate the important occasion. While there appears to have been a lot of preparation for many of the celebrations, including the issuing of commemorative postage stamps, there appears to have been little preparation for the issue of a commemorative bank note. The simplicity of the overprint and the fact the initial issue was made only at the Dhaka office of the Bangladesh Bank, and not at any of the other principal offices, suggests the issue prepared to commemorate the Silver Jubilee was rushed. First issued 20 July, 1983. Size 147 x 70 mm. Colours Front – Green intaglio printing with an under-print of purple, orange and brown. Back – Green with a pink and green under-print. The 20-taka note of this issue (see Figure 13) has only four changes to its predecessor. First, a white disc has been placed over the watermark on the front of the note to allow easier viewing of that feature; second, the watermark has been changed (as it has for all notes in this series); third, the micro-printed security thread now has Bengali text; and finally, the area reserved for the watermark on the back of the note is white, unlike its predecessor which had a fine shading of purple and yellow. Micro-printed security thread, Type A; 3.5 mm serial number; the signature is black. Micro-printed security thread, Type C; 2.5 mm serial number; lighter shade of green used for intaglio printing; the signature is green and is now part of the plate printing. As for variety b), but the micro-printed thread is Type A. As for varieties b) and c), but the micro-printed thread is Type H.
The 20-taka note continued to be issued concurrently with the notes of the seventh series. Variety ‘d’ adopts the same style of security thread used on the notes of the seventh series. However, the thread used on this denomination carries the Bengali text মেঘনা ৳২০ (Maghna Tk. 20; i.e. security thread Type H). The Maghna River is one of the principal rivers of Bangladesh. This is the second thread to carry the name of a river, as the 10-taka note of the seventh series (issued before this note) carries the word ‘Padma’, after the Padma River. Smaller, dated issues of the same design as this note are considered a new type, because of the reduction in size. Therefore they are not included in the Sixth Issue. First issued 24 August, 1987. Front National Mausoleum at Savar. Size 153 x 70 mm. Security thread Micro-printed in Bengali, Type A.
Colours Front – Orange, green and black intaglio printing, with a dominant under-print of pink, blue and khaki. There are highlights of purple. The 50-taka note (see Figure 14) made its appearance on 24 August 1987 and introduced a dramatic new design differing greatly to other notes of this issue, and previous issues, by the Bangladesh Bank. The most noticeable features are the lack of a white margin and the use of bright, distinct colours in a similar manner to the 1- and 2-taka notes issued by the Government. Another noticeable alteration is the centring of the illustrations on the front and the back, whereas on previous notes the illustrations had been set to the left or right. On the front of this note is an illustration of the National Mausoleum at Savar (see Figure 15), with the text below the illustration reading জাতৗয় স্মৃতিসৌধ, সাভার (National Mausoleum, Savar). To the right of the National Mausoleum is a white oval, which contains the watermark, while the promissory clause is to the left. The back of the note has a depiction of the National Parliament House (see Figure 16), below which is written জাতৗয় সংসদ ভবন (National Parliament House). To the left of the illustration is the white oval for the watermark and to the right is the emblem of the Bangladesh Bank. Above the emblem of the Bank is a white shape which registers perfectly with the same shape on the front of the note. The front of the note is printed in red, green and black intaglio ink, while the under-print consists of pink, blue and khaki lithographic inks. The back of the note has red and black intaglio ink, with pink, blue and purple lithographic inks. On both the front and the back, the black intaglio ink is used only for the illustrations. The same micro-printed thread is used for all varieties of this note, this being the Type A thread. The three varieties of this note are due to changes in serial numbers, the watermark, the design, and colours. Type 4 watermark; 3.5 mm serial numbers with seven numerals; the text ‘Bangladesh Bank’ (বাংলাদেশ ব্যাংক) and ‘Fifty Taka’, on the front of the notes is shaded with cross-hatched lines. Type 4 watermark; 3.5 mm serial numbers with seven numerals; the text ‘Bangladesh Bank’ (বাংলাদেশ ব্যাংক) and ‘Fifty Taka’, on the front of the notes is shaded with solid colours. Type 5 watermark; 3.0 mm serial numbers with seven numerals; modified design and colour. An example of the ‘a’ variety with the signature of Shegufta Bakht has been seen with lighter black on the front of the note (see Figure 17). It is not known if this lighter printing is due to variations in printing or is common to all notes of this variety. Korshed Alam had previously been the Finance Secretary, having signed both the 1- and 2-taka notes and, after becoming Governor of the Bangladesh Bank, had signed the 5- and 10-taka notes. However, his signature on the second and third varieties of the 50-taka note has been taken from a different specimen signature and there is a noticeable, although not dramatic, difference to the signatures used on the other notes he has signed. On the fourth variety of the 50-taka note, his signature reverts to that used on most other notes. However, this is not an entirely accurate description, as the watermark has also changed, while remaining similar in style to the previous watermark. The new watermark is the Type 5 watermark (see Figure 30) and, for all Bangladeshi banknotes, it is used only in this variety of the 50-taka note. The change in colour for variety ‘d’ is most noticeable on the back of the note where the distinctive purple and pink colours, used in the design immediately to the right of the white oval holding the watermark, are both replaced by a pale purple. It is supposed that the replacement of two colours by one colour has made the production of the notes slightly cheaper. Although this change in colour is distinct, the easiest way in which this final variety can be distinguished is the change in shading to the clouds above the Parliament House on the back of the note (see Figure 18). Back Southern gate of Lalbag Fort. Size 163 x 70 mm. Serial number 3.0 mm high. Single letter prefix. Colours Front – Blue, brown and orange intaglio printing, with an under-print of blue, green, purple and khaki. Back – Brown, dark blue and light blue. In the Bangladesh Observer, on 4 December 1981, it was reported some of the 100-taka notes were issued without the signature of the Governor of the Bank. Assurances were given by the Bank these notes could be exchanged for notes without the defect. It is unlikely any of these notes were put aside by astute collectors. First issued 1 November, 1983. The ‘d’ variety of the 100-taka note is due to the introduction of a segmented foil security thread with micro-printing on it, and this is the first note to use such a thread. The thread is opaque, with the micro-printing being formed by the absence of thread. (This type of thread is subsequently used in some notes of the Seventh Issue.) Written on the thread of the ‘d’ variety of the 100-taka note is শাপলা ৳১০০ (Shapla Tk. 100). The ‘Shapla’ is the national flower of Bangladesh (see Figure 21). For the 100-taka notes signed by Mohammed Farashuddin there are a total of four varieties. Variety ‘e’ is first variety signed by Mohammed Farashuddin, with the other three varieties (‘b’, ‘c’ and ‘d’) the result of old stocks of paper being used. These three odd varieties, with the signature of Mohammed Farashuddin, are the rarest notes of the modern issues. Size 170 x 70 mm. Watermark Attentive tiger (Type 4) and ৫০০ (‘500’, Type 3 watermark). Colours Front – Blue, purple and black intaglio printing with an under-print of blue, orange and brown. Back – Black, blue, brown and orange. The 500-taka note (see Figure 22) – incorporating depictions of the Star Mosque on the front and the Supreme Court building on the back – was introduced to the public on 1 March 1982 and the first variety is identical to its predecessor with the exception of three features: the watermark, the shading over the watermark and the signature of the Governor. The watermark is now the standard head of the Bengal tiger used by all notes in this series, while the pattern of vertical lines over the watermark, as used on the previous issue, is removed to create a white area. The initial issue of the 500-taka note in this series carried a serial number of six numerals, which differed to the standard seven numerals of the other notes in this issue. However, in 1995 a variety was released carrying eight numerals in the serial number. This was the first note issued in Bangladesh with so many numerals in the serial number (although it is not known when the 50-taka note with eight numerals was issued). Another innovation, introduced during the life of this note, is the introduction of micro-printing – appearing for the first time on a Bangladeshi note. Although absent on the first variety of the 500-taka note, a line of micro-printing repeating ‘BANGLADESH BANK’ in English then repeated in Bengali (বাংলাদেশ ব্যাংক) appears on the front of the second and third varieties of this note, below the intaglio border at the top. It is interesting to observe the signatures for all three gentlemen who signed these notes are slightly different to the signatures used on other denominations. The differences are quite minor and appear to be due to new specimen signatures being provided to the printer, with the probability these notes were printed by a different printer to the printer used for the lower denomination notes. The seventh series of notes is peculiar in the issues of Bangladesh to this point, as only three notes constitute the series – 10-, 50- and 500-taka notes. For the other denominations, existing designs of the Sixth Issue continued to be issued and circulate alongside the three notes of the Seventh Issue. Some features in this issue, such as the introduction of micro text on the security threads naming national emblems, was used for later varieties of the Sixth Issue, such as the 20- and 100-taka notes. The three notes of this issue carry the third form of the promissory clause. Of interest is an obscure change in the Bengali text labelling each illustration in the three notes of this issue. At the end each label, consisting of Bengali text, is a vertical bar. This is the Bengali ‘full stop’ and its use only in this series of three banknotes is a peculiarity. There are now no 1-taka notes being produced by the Bangladeshi issuing authorities. 1-, 2- and 5-taka coins are now circulating, all having been introduced during the period in which the Sixth Issue of bank notes was circulating. Back The Lalbag Fort Mosque. Size 139 x 69 mm. Watermark Sheikh Mujibur Rahman (Type 6). Serial number Both varieties have seven numerals and it is thought all serial numbers have a two-letter prefix. Colours Front and back – brown and green on a background of green, pink, brown and blue. The first note in the Seventh Issue to be introduced was the 10-taka note (see Figure 23), in early 1998. It was an issue dramatically different to the note it replaced, and different to most previous notes issued by the Bangladesh Bank. In 1996 a new government was elected in Bangladesh, with the new Prime Minister being Sheikh Hasina Wajed – the daughter of Sheikh Mujibur Rahman (see Figure 24). Since her initial elevation to the role of Prime Minister, Sheikh Hasina Wajed has sought to reinstate the memory of her father as a national hero. Part of this effort resulted in the issue of a 10-taka note carrying the portrait of Sheikh Mujib. The general style of this note differs in many respects from other notes issued in Bangladesh. The principal difference is the variety of colours used in the note, with a rainbow of green, brown, pink, brown and blue being used as an under-print on the front and back of the note. There are borders on the front and back of the note in green, while the portrait of Sheikh Mujib is brown and black. Although the format of the serial numbers and the form of the promissory clause (third form) remain the same as the 10-taka note it replaced, there are dramatic changes to the watermark and the security thread. The watermark is no longer the head of a Bengal Tiger, but the head of Sheikh Mujib – with the watermark being a replica of the portrait appearing on the front of the note. A foil security thread is used on this note with the majority of the thread being solid and the micro-printed text is formed by the absence of foil on the thread. The micro-printed text reads পদ্মা ৳১০ (Padma Tk. 10’; i.e. security thread type D). The ‘Padma’ is the name given by Bangladeshis to the river Ganges when it flows through Bangladesh. Later use of the foil thread in Bangladeshi banknotes sees different words used on the thread. In all cases the word refers to a national icon (see the section on ‘Security Threads’ for the Type E, G and H threads). The back of the note carries an illustration of the Lalbag Fort Mosque (see Figure 25), below which is printed লালবাগ কেল্লা মস্‌জিদ, ঢাকা (Lalbag Fort Mosque, Dhaka). First issued 2 July 1998. Back Supreme Court building in Dhaka. Size 170 x 69 mm. Watermark An attentive tiger (Type 4). Serial number Seven numerals in the serial number and two letters in the prefix. Colours Front – brown, blue and orange on an underprint of colours in the orange and green sections of the colour spectrum. Back – grey with orange, green and pink. In July 1998 the new 500-taka note (see Figure 26) was released. The new note has a style which resembles the 50-taka note of the last issue, with this style being reinforced by the depiction of the National Mausoleum at Savar (see Figure 15) on the front of the note (which also appeared on the front of the 50-taka note). The illustration of the National Mausoleum is on the right, while to the left is a white area for viewing the watermark. The watermark is of an attentive tiger (the Type 4 watermark), which is the same as that used for most notes of the Sixth Issue. Below the watermark is a design of shapla flowers, which is used as a perfect registration device with a complementary design on the back of the note – similar to the corresponding device on the previous 500-taka notes. In the pool of reflection in front of the National Mausoleum is written জাতৗয় স্মৃতিসৌধ, সাভার (National Mausoleum, Savar). The front of the note is printed using intaglio and lithographic processes. The intaglio printing is used for the National Mausoleum and the ornate border of the note, with three colours being used: brown, blue and orange. The colours used for the lithographic inks are predominantly in the orange and green sections of the colour spectrum. The back of the note continues to carry an illustration of the Supreme Court building in Dhaka, although the building has been redrawn for the new note. One interesting feature of the illustration of the Supreme Court is a map of Bangladesh in the arch below the central balcony. This map is a mural on the Supreme Court building. The back of the note is printed entirely by lithography, with the dominant colour being grey, but also including a liberal use of orange, green and pink. The text below the illustration reads বাষা মস্‌কিজদ, রাজশাহী (Supreme Court building, Dhaka). The 500-taka note carries a segmented security thread with no micro-printing. However, micro-printing is used on the front of the note in a line repeating ‘BANGLADESH BANK’ (English only) below the panel containing the title of the issuing authority: ‘Bangladesh Bank’. There are no varieties for this note, with the only signatory being Lutfar Rahman Sarkar. First issued 22 August 1999. Back Bagha Mosque of Rajshahi. Size 152 x 69 mm. On 22 August 1999, the 50-taka note was introduced. This note continues the design style introduced with the 10- and 500-taka notes. On the front of the note is the National Parliament building, Dhaka (see Figure 16), which had been illustrated on the back of the 50-taka note of the previous series. The back of the new note carries an illustration of the Bagha Mosque at Rajshahi, below which is written সুপ্রীম কোট ভবন, ঢাকা (Bagha Mosque, Rajshahi). The watermark of the attentive tiger (Type 4) is used on this note and is singular in its representation – in that the watermark is on the right-hand side of the note and the tiger is looking towards the centre of the note. The previous 50-taka note is the only other note to have the attentive tiger watermark on the right-hand side of the note, but on that note the tiger was looking in the other direction. The security thread on the 50-taka note is similar to the thread used for the 10-taka note. It is a foil thread with micro-printing punched out of the thread, with the text on the thread reading দোয়েল ৳৫০ (Doyal Tk. 50; security thread Type G). The ‘Doyal’ is the national bird of Bangladesh and is illustrated on the back of the 2-taka notes (see Figure 5). To the right of the white area used for viewing the watermark, on the front of the note, is a design of flowers and leaves. This design registers perfectly with a similar design on the back of the note. The 50-taka note is the first note to be issued with the signature of Dr. Mohammad Farashuddin, although the 100-taka note of the sixth series with Dr. Farashuddin’s signature was introduced at about the same time. 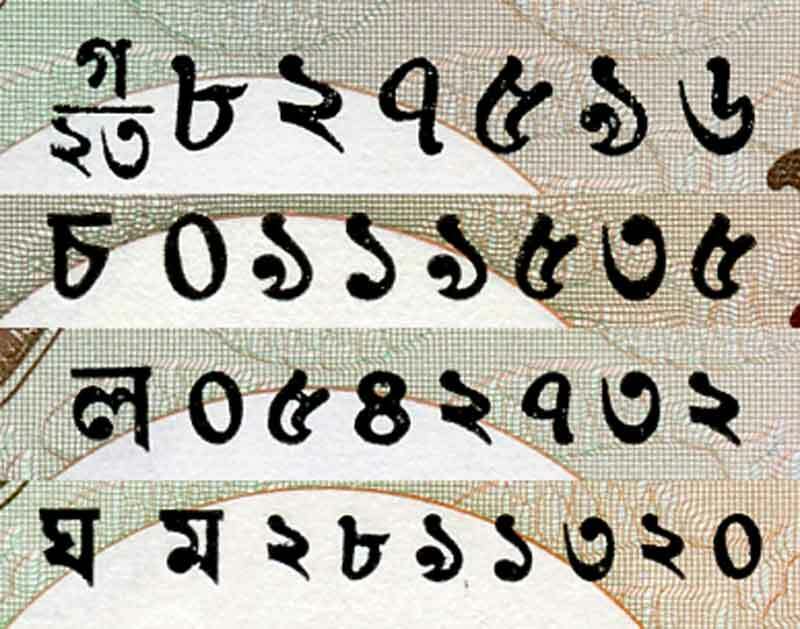 All banknotes in the Sixth and Seventh Issues carry serial numbers in Bengali characters – letters and numerals. The serial number prefixes are, with one exception, either a single or double letter, with the letters always consonants. The single exception is the first variety of the 5-taka note of the Sixth Issue which has a fractional serial number prefix. Serial numbers are written in four different font sizes, as seen in Figure 28. The font sizes are 4.0 mm, 3.5 mm, 3.0 mm, and 2.5 mm. However, some of the fonts are printed in different thicknesses and Figure 3 shows examples of thicker and thinner fonts. Figure 28: The four sizes of serial numbers used in the Sixth Issue – 4.0, 3.5, 3.0 and 2.5 millimetres. One watermark dominates the Sixth Series, the attentive tiger illustrated in Figure 29. 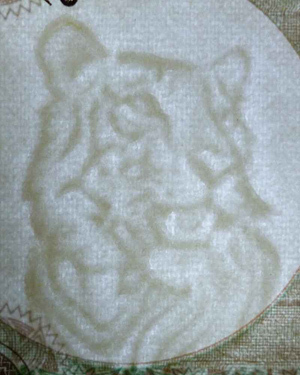 This is the Type 4 watermark used on banknotes issued in Bangladesh, with the earlier three types being used in the first five issues of banknotes; that is, Type 1 the roaring tiger, Type 2 the resting tiger, and Type 3 the Bengali characters for ‘500’ (৫০০). While subtle variations can be seen in many of the Type 4 watermarks, the only real variation is the small sized watermark used in the 2-taka note, variety ‘d’. However, the last 50-taka note of the Sixth Issue has enough distinct differences to see it identified as a separate watermark. This is the Type 5 watermark and it is illustrated at Figure 30. The Type 6 watermark is the head of Sheikh Mujibur Rahman. 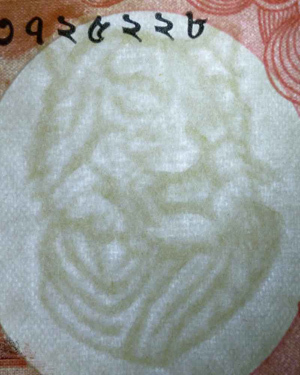 This watermark appears only on the 10-taka note introduced in 1998 in the Seventh Issue. 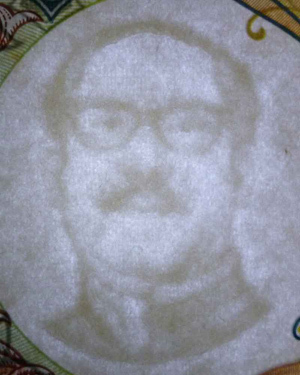 Shown at Figure 31, the watermark depicts the same image of Sheikh Mujib which appears on the front of the 10-taka note. Figure 29: The Type 4 watermark. Figure 30: The Type 5 watermark. Figure 31: The Type 6 watermark. There are many types of security threads used on the bank notes issued in the Sixth and Seventh Issues. Some banknotes carried a solid security thread (embedded or windowed), but most carried micro-printed text or larger text on the threads. The different types of threads using micro-printed text and larger text are described here, giving some background and showing the format of the text on the threads. All micro-printed threads carrying Bengali text (i.e. Types A, C, D, E, F, G, H & I) have the text printed in such a manner it can be read alternately from the front and the back of the notes. The first security thread to carry micro-printing appeared in the 500-taka note of the Fourth Issue, introduced in 1976. The thread carries the Bengali text বাংলাদেশ ব্যাংক (Bangladesh Bank). Subsequent renditions of this micro-printed thread have varying degrees of clarity, with regard to the text. This may be due to changes in production techniques, or it may be due to a change in the manufacturer of the paper, or manufacturer of the micro-printed thread. This thread is used for some notes in the Sixth Issue. The format of the thread is shown here, as is a photograph of the thread from a note. This thread is not used in the Sixth or Seventh Issues, but is included here for reference. The second micro-printed thread was used in the 20-taka note of the Fifth Issue. This thread carried micro-printing of ‘Bangladesh Bank’ printed in English. The Type B thread was used only once, and it is the only micro-printed thread in all Bangladeshi issues to use English text. The first style of the micro-printed thread to carry বাংলাদেশ ব্যাংক (Bangladesh Bank), i.e. Type A, has distinct, well-shaped characters and can easily be read under magnification. The Type C thread has poorer quality printing, with some letters being indistinct and others appearing incomplete. In the example illustrated here, it is difficult to distinguish the first two characters of the word বাংলাদেশ (Bangladesh), as the two characters appear as one blurred character. The fourth character in বাংলাদেশ appears without the matra (the bar or line from which most letters are suspended). The letters of the Type C thread, as well as being indistinct, are also smaller than on the Type A micro-printed thread. While keeping the same format as the Type A thread, the illustration here shows the indistinct nature of the characters in the Type C thread. In 1998 the introduction of the new 10-taka note in the Sixth Issue saw the introduction of a new type of security thread, the ‘Type D’ micro-printed thread. With the former micro-printed threads, the text was solid while the remainder of the thread was translucent, but the new thread is solid and the micro-printed text is translucent. The text on the Type D micro-printed thread reads পদ্মা ৳১০ (Padma Tk. 10). The 100-taka note was also issued with the foil micro-printed thread, in the same style as the Type D thread. On this foil thread the text reads শাপলা ৳১০০ (Shapla Tk. 100). The ‘Shapla’ is the national flower of Bangladesh (see Figure 21). This thread is used as a segmented thread (in the ‘d’ variety of the second 100-taka note) and as a wholly embedded thread (in the ‘e’ variety of the second 100-taka note). After using a micro-printed thread with the words বাংলাদেশ ব্যাংক (Bangladesh Bank) on it for a number of years, the 2-taka note was finally released with a thread bearing the words বাংলাদেশ সরকার (Government of Bangladesh). The introduction of this thread corrects the anomaly of the Bangladesh Bank being mentioned on the thread of a note where the note was not the responsibility of the Bank. The 20-taka note of the sixth series adopted a foil thread for variety the ‘d’ variety of the 20-taka note. Similar to the other foil threads, the text on the new thread reads মেঘনা ৳২০ (Maghna Tk. 20). The Maghna River is one of the major rivers in Bangladesh. The 3 mm iridescent Type I thread carries the simple text বাংলাদেশ (Bangladesh). While having different text to the other micro-printed threads, the most imposing aspect of this thread is the iridescent surface of the thread. Light is reflected from the thread in all colours of the spectrum. Over a number of years the following people have assisted me in the preparation of this study: Aminul Haque Mallick, Didar Absur Choudhury, Chris Hall and Murray Hanewich. I am particularly grateful to Mohammed Islam, the author of Paper Money of Bangladesh, for the details he has collected over many years and the information he has shared with me on the banknotes of Bangladesh. My added appreciation is extended for his review of this article; although any errors remain mine. Ashan, Syed Ali [Editor] Bangladesh—A souvenir on the first anniversary of Victory Day December 16, 1972 Dhaka; Ministry of Information and Broadcasting, Government of the People’s Republic of Bangladesh, 1973. Bruce, Colin R. and George S. Čuhaj 1998 Standard Catalog of World Paper Money — Sixth Edition — Volume Three — Modern Issues 1961–2000 Iola, USA; Krause Publications Inc., 2000. Murray, Jon Bangladesh—a travel survival kit (Second Edition) Hawthorn, Australia; Lonely Planet Publications, 1991. Newton, Alex, Betsy Wagenhauser and Jon Murray Bangladesh—a travel survival kit (Third Edition) Hawthorn, Australia; Lonely Planet Publications, 1996. Many collectors of banknotes issued in Bangladesh nominate notes which have single and double prefixes as separate varieties. This distinction is not made in this article. All text on the one-taka notes, including the titles of the signatories is in Bengali. For a description of the mihrab of the Kusumba Mosque, see IBNS Journal Volume 51 Number 2, page 30, Figure 26. While the previous 10-taka note also had a vignette of the Atiya Jami Mosque, on the new note the aspect of the mosque is changed. For a description of the mosque, see IBNS Journal Volume 51 Number 2, page 30, Figure 27. For a description of the Chota Sona Mosque, see IBNS Journal Volume 51 Number 2, page 31, Figure 30. For a description of the Star Mosque, see IBNS Journal Volume 51 Number 2, page 26, Figure 15. For a description of the southern gate of the Lalbag Fort, see IBNS Journal Volume 51 Number 2, page 30, Figure 24. For a description of the Supreme Court building, see IBNS Journal Volume 51 Number 2, page 28, Figure 21.